President Donald Trump has made a head-snapping turnabout on the budget during his first two weeks in office, seemingly transforming himself from the fiscal hawk we saw on the campaign trail insisting he would bring down the long-term debt to a big time spender places budget concerns on the back burner. But just as his boasting several weeks back that he was on the verge of unveiling a comprehensive plan to simultaneously “repeal and replace” the Affordable Care Act proved to be more aspiration than real, a Trump pledge to slow the growth of the nearly $20 trillion gross national debt must be taken with a grain of salt. The non-partisan Congressional Budget Office and government watchdog groups have issued repeated warnings that the country is headed toward trillion-dollar annual deficits, soaring government interest costs and economic instability without a serious course correction in spending and tax policy. The debt currently is projected to rise from 77 percent of Gross Domestic Product to 89 percent by the end of the decade. A return to a balanced federal budget – once a rallying cry of congressional Republican leaders – is now little more than a pipe dream, especially after Trump made it clear late last month that defense and national security spending must take precedent over all else. Last year was the first time the budget deficit rose since 2009 – an ominous sign for lawmakers and policy experts that the government was once again on the road to massive $1 trillion a year deficits that were common during the financial crisis and recession. CBO’s latest projection is for a $559 billion deficit in fiscal 2017 or $28 billion more than last year’s levels. Even if the new president were more committed to containing or even reducing the annual deficit, it wouldn’t be easy. 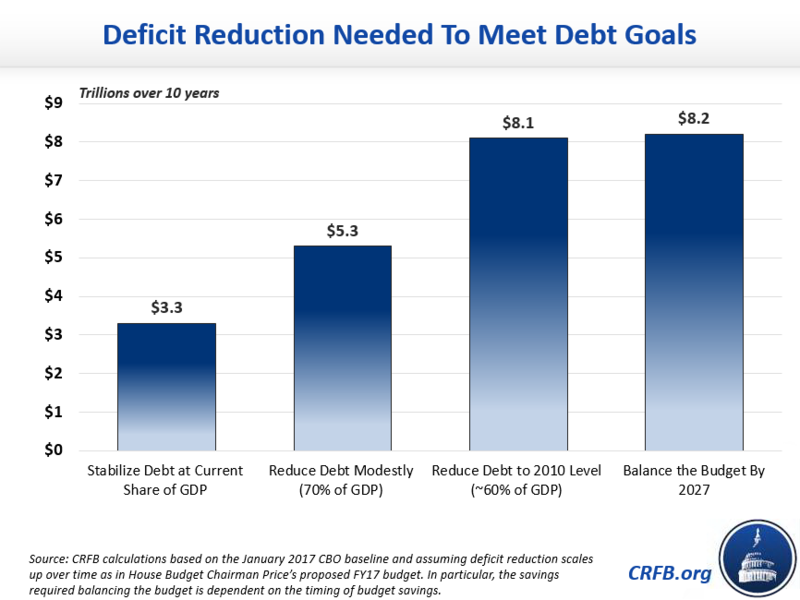 A new analysis by the Committee for a Responsible Federal Budget estimates that balancing the budget by 2027 would require about $8 trillion of deficit reductions over 10 years. That would require sharp cuts in domestic and defense spending and savings in entitlement programs including Medicare and Medicaid. House Speaker Paul Ryan (R-WI) and other House GOP leaders have a series of “Better Way” plans on the drawing board for replacing Obamacare and sharply reducing Medicare and Medicaid costs through a major restructuring of the health care system; prospects for enactment are iffy at best. Simply putting the debt on a more sustainable growth path during relatively good economic times – an idea that has drawn approval from liberal groups and think-tanks as well as fiscal conservatives – would still require several trillions of dollars of spending cuts and tax increases that would be difficult to enact given the sharp partisan divide in Washington. Just stabilizing the debt at its current level of 77 percent relative to the overall economy would require $3.3 trillion of deficit reduction over ten years, according to the CRFB report. Amid the flurry of Trump’s early spending policy pronouncements, especially his demands for a military buildup in the face of threats from North Korea and now Iran, budget-busting may become the order of the day. “If this all were to come about, then the debt ratio would rise faster than CBO says, and therefore would be even more undesirable than the current trend,” Kogan said in an interview late last week. Trump late last month ordered Defense Secretary James Mattis to come up with a comprehensive plan within two months to improve overall readiness in the armed services by fiscal 2019, including updating the nuclear arsenal and strengthening defenses against a possible nuclear attack by North Korea or Iran. He has put Congress on notice that he expects lawmakers this spring to lift the legal cap on defense spending to accommodate his military ambitions – a move that would add $500 billion in the coming decade. And Trump has signed a number of executive orders making it clear that Congress must spend $15 billion or more building a wall along nearly 2,000 miles of the U.S.-Mexico border. He also wants to hire thousands of new border security agents and immigration officials to beef up security and prepare for mass deportations. And he even hinted or joked that he might have to send U.S. troops into Mexico to help that government combat drug cartels and dangerous gangs. After seven years of decline following the worst of the Great Recession, the budget deficit is on track to steadily grow again, adding nearly $10 trillion to the overall debt in the coming decade, according to new projections from the nonpartisan Congressional Budget Office. As annual shortfalls between spending and revenues pile up in the coming years, publicly held debt will rise from 77 percent of gross domestic product by the end of 2017 to 89 percent of GDP by 2027. In dollar terms, publicly held debt – the amount the government borrows to cover revenue shortfalls and keep the government operating -- will increase from $14.8 trillion at the end of this year to $24.9 trillion by 2027, according to CBO’s baseline analysis. During his Senate confirmation hearing late last month, Rep. Mick Mulvaney (R-SC), Trump’s nominee to head the Office of Management and Budget, was pressed to explain how Trump intended to pay for a military buildup while keeping a campaign pledge to protect Social Security and Medicare. Mulvaney, a Tea Party conservative and a sharp critic of defense spending and rising debt, replied that his role as White House budget chief would be to “deliver hard truths” to Trump, as The New York Times reported. And one of those truths could be raising the eligibility age for Social Security and tightening other entitlement programs. While Trump and his Republican allies on Capitol Hill are determined to lift the spending caps on defense, congressional Democratic leaders are equally determined to raise the caps on domestic programs that are most important to their constituents. Even with control of Congress, GOP leaders will need Democratic support in the Senate to approve major spending measures. “I would think the deficit is headed up, but not as much as the apocalyptical projections of some,” Reischauer said.